This day is like finding $20 in the pocket of your jeans before they go in the wash. Its a bit of a surprise since I started this journey thinking I’d be packing it up after 30-days. But its a pleasant surprise, like that $20, that 31 days in, I’m stronger than ever! What a great Super Bowl! And a perfect excuse for some new W30 approved recipes that are healthy and delicious. Keep reading! Breakfast: YUM! You know I look forward to making a nice Sunday breakfast. 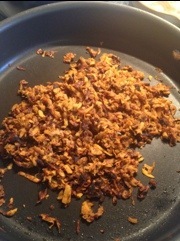 These Sweet Potato Hash Browns from 3-Ring Binder are simple and delicious. And even simply delicious. And deliciously simple. Alright, you get the picture. Speaking of Kale, look what showed up at Jewel this week. 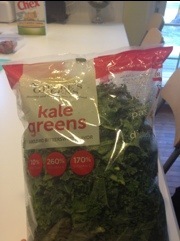 I’m having a great time with this bag of kale. I’m going to tell the customer service desk how much I appreciate this and hope they keep showing up! Such a great way to start a healthy day! For lunch, warmed 2 PWO muffins (no workout) and some hash. 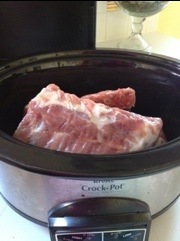 With 4 hours until kickoff, I took on a cooking challenge–RIBS! This was on my list of new foods I wanted to try. 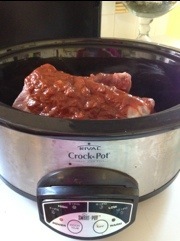 I found a great recipe for Slow Cooker Ribs on I Eat Mostly Meat. I modified the sauce just a bit for W30 (no sweetener, molasses, liquid smoke, bacon grease) and didn’t miss any of it! 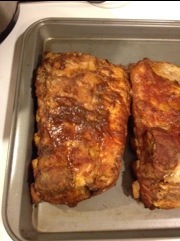 I also cooked them on high for about 3 1/2 hours. Then I finished them in a 425 degree oven for about 10 minutes. Topped with the sauce: which was absolutely delicious, even by itself! These got rave reviews and were a grand success. For a first-time recipe, I was most pleased. I also made The Best Chicken You will Ever Eat. Ever. from Clothes Make the Girl. Since her recipes are generally W30, I didn’t have any modifications. 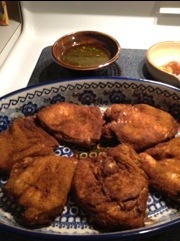 I did bake the chicken since my grill is on winter break. I also made the dipping sauce (in the small bowl). This was also very good and got great reviews. The flavor was unique and spicy. The brine made the chicken very moist and juicy. I also made Mel’s Favorite Chili from Clothes Make the Girl. I used grass fed ground beef and really enjoyed this recipe too. The cocoa powder makes this very unique. I enjoyed serving it over some spaghetti squash. In fact, next time, I think I would add some vegetables to the recipe. I also made the guacamole recipe from Whole30. I liked it better than any other recipe I’ve tried. It had a great fresh flavor. A try of kale chips later, and I was ready to party! 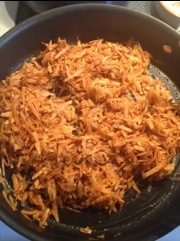 After dinner, I tried a recipe that Donna Johnson from Renovate Your Lifestyle shared with me. What a great, healthy treat–berries and coconut cream. I sliced some strawberries and sprinkled a little unsweetened cocoa powder over them. I refrigerated a can of coconut milk for about 4 hours and then dumped it in a bowl and whipped it with a hand mixer, like I was making whipped cream. A few minutes later, I had a delicious snack. And, its not every night that you get to go the the Kitty Bowl. 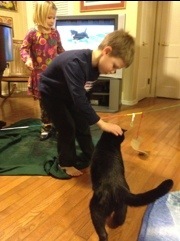 Yes, modeled after the Puppy Bowl, we had our very own Kitty Bowl that Pearl organized. 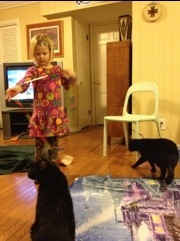 Here she is with her players (or subjects) Simon and Jack. 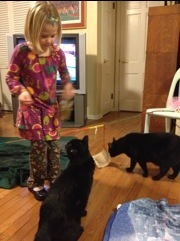 She even talked Pierce into participating. 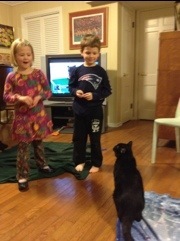 Patriots fans–Pierce is one of you ;-( Giants fans–enjoy your celebration. This entry was posted in Daily Reports, Recipes and tagged Avocado, Breakfast, Chicken, Chili, Chocolate, Chocolate chili, Crock pot, Dinner, Guacamole, Hash browns, Kale, Moroccan, Pork, Recipes, Ribs, Slow cooker, Super bowl, Sweet Potatoes. Bookmark the permalink. Thanks for the shout outs to my recipes! Sounds like you had a super fun (and tasty) Super Sunday. Love the Kitty Bowl! 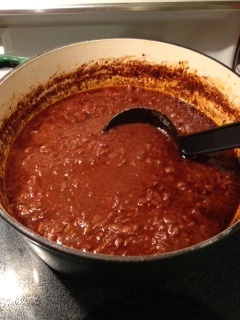 We had Chocolate Chili, too… and we were cheering for New England. boo. Hi Melissa! WOW! This is a really cool moment for me to hear from you on this blog. I LOVE your energy and your blog and your amazing recipes. Oh, and your cookbook. Thanks for everything you’re doing to move this idea forward–deliciously.